There are few books out there that bridge the gap between the Krishna conscious philosophy and personal development, which is what this blog is about (or may be my struggles would be more accurate). The books write about enlightened people that have figured it out, while all of us others are bogged down with mundane struggles like dealing with job, family, friends and somehow fit a religious life into it. Few are able to give it all up and become a celibate, living in a temple or work as a travelling preacher living the way he/she preaches. The gap between what we ideally would like to live and be versus how we actually are and live is huge. It takes years and years to align intention with action. 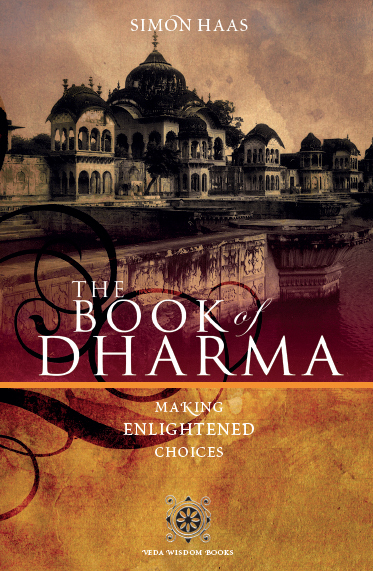 So when I heard about “The Book of Dharma: Making Enlightened Choices” I was intrigued. I wondered if this book would somehow teach me something new, give me some moments of insights. While I was looking at the vedic texts for information, they were designed to lead me to transformation. When we read personal development books it’s about making changes to our life. We gather information and in that process working to change something in us that we want to change. So would this book teach me something new? Would it make me see things in a different perspective? More importantly, would it make me want to change anything, create that seed of different beginnings? If you sit on a bicycle with your hands on the handlebar, you act of steering has no potency or effect unless you are moving forward. Similarly, these wisdom principles are principles in action. We invoke them by living them. When we no longer live them, they withdraw. They remain then on the level of artefacts of the mind, what the ancients describe as ‘mere weariness of the tongue’. The book has a lot of great quotes like the one above written in an easy, understandable language. He comes from the Gaudiya Vedanta line using the vedas as the basis, but one doesn’t need to have any philosophical understanding to read and understand this book. Though I suspect that few will pick up this book without knowing or being in the Gaudiya line. The book title makes sure of that since few westerners know of the word dharma unless you somehow are spiritually inclined. That’s a little bit bad, because it’s such a good book that it deserves a bigger audience, especially in the personal development category. This book touches upon subjects like non-violence, purity, truth and action that has not been touched on any other personal development books I have read. So what is Dharma? It’s the art of bringing out our full latent potential as human beings. The first part of it is called “Living by intelligent design”. It was well written, but if you have read Eckhart Tolle’s “A New Earth” , you have the same message just spread over a vast larger amount of pages and in more detail. And for me – I was beyond it. But, enjoy it, read it and read Eckhart Tolle if that is where you are. When we dishonour who we are, we live against Truth. This brings instability and weakness into our life. Part two is where it gets interesting and the four dharma principles are discussed: truth, purity, non-violence and discipline. I really loved reading about this principles as they each made a mark on me. These principles is how I want to live my life, just written down and made more clearly. I suddenly saw what I had to work with within each of these principles. No other book has given me this before. I had come at a standstill in my development because I didn’t know what to work with. I don’t have any deep ingrained issues from childhood or whatever I needed to work through. I have found the type of work that is perfect for me. I have a boyfriend and have no interest in pursuing romantic interests. My personality is pretty much how I like it to be except small modifications needed here and there that I deal with whenever a situation arises. So why am I still so exhausted from my life? When I got this principles I suddenly saw there are still areas I could grow. More importantly, I could use these principles in my life as it is now, even though I’m not happy in my life. Following these principles and putting them into measurable goals will improve my life, thereby making it more in line with who I am. So I got the answer, but I haven’t really been good at following them but that’s another blog entry for another time. The third part is about applying these principles in everyday life. That’s where I thought this book became a little bit weak. It’s easy to follow these principles when you are a munk in a temple. It’s a whole different bargain when you are a grihasta, having a family, job, children, living outside of india or anywhere close to spiritual association. He does have some good points though, it just became a bit easy for me. Does it matter? None at all. I got what I needed from this book anyway and I’m more wiser because of it.